Bedwetting or sleep enuresis is a condition wherein a person urinates in the middle of his or her sleep. Bedwetting surely had been a problem to all of us at some point in our lives, especially during our younger years. A study or research conducted by the National Association for Continence founded that more than 5 million children in the United States are suffering from sleep enuresis or bedwetting. Usually, young children can outgrow bedwetting, however, there are some young children who can’t. As a matter of fact, bedwetting does not only affect young children, bedwetting can also affect adults. Bedwetting are classified into 2 different categories, the primary nocturnal enuresis and the secondary nocturnal enuresis. For primary nocturnal enuresis, the child suffering from the said condition has control over his or her bladder all throughout the day but for the last 6 months, the child has consistent occurrences of bedwetting. 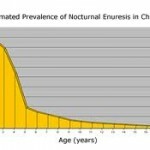 For secondary nocturnal enuresis, the child will somehow be able to control his or her bladder at night for approximately 6 months, but after 6 months, the child is suffering from consistent episodes of bedwetting again. Genetics – heredity or genetics play a very big role in bedwetting. Studies and researches show that if at least one parent of a child suffered from bed-wetting before, then the child has at least 50% chance of suffering from bedwetting. The chance of a child to suffer from bedwetting will increase to 75% if his or her parents suffered from bedwetting before. And if the child’s parents were not bed wetters, the child still has 15% chance of suffering from bedwetting. Bladder Problems – having bladder problems or issues can be a contributing factor for bedwetting. Bladder problems can include an alteration or abnormality in the brain’s sending signals to alert if it is time to urinate or not. There are also some problems in the muscles that hold the urine inside the bladder or the production of urine is too fast that the person’s bladder can’t hold the urine long enough. And also, drinking too much oral fluids nearing bedtime can also cause bedwetting since the bladder can’t hold too much urine.